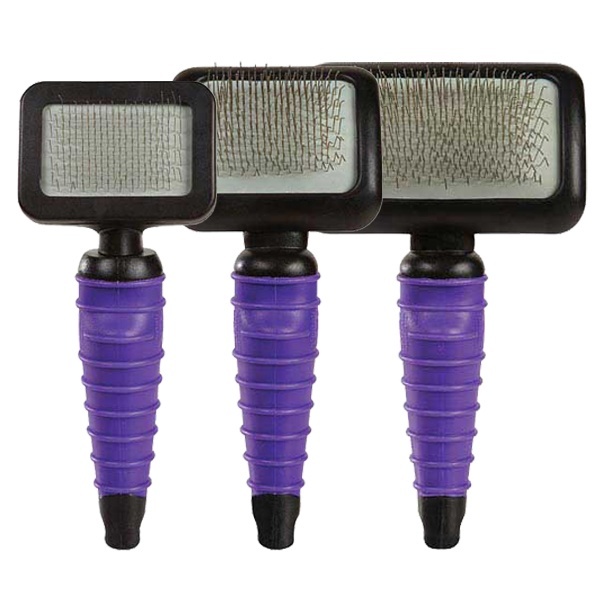 This Master Grooming Tools Ergonomic Slicker Brush features molded, double-coated rubber handles in a lovely purple or teal color. The ergonomic handle fits the hand perfectly and provides greater control for comfortable, effortless brush outs. Keeps your hand in a natural position to prevent fatigue and repetitive motion injury. Groomers love using this comfortable slicker brush that features a ton of style and function! Strong and durable, yet light enough to glide through tough grooming jobs. Stainless steel pins are cushioned to ensure that pets are brushed comfortably. Rounded design promotes more comfortable brushing. X-Small 2 3/4 L x 2 W; pin surface of 2" x 1 1/4"
Small 3 1/8 L x 2 ½"W; pin surface of 2 1/2" x 1 3/4"
Medium 4"L x 2 1/2"W; pin surface of 3 1/4" x 1 3/4"